In the article, I will be going over some tips on how to get more people to follow you on Twitter. As you well know, Twitter is an awesome social media platform and one of the best places to promote your business. However, for your use of Twitter to be effective you must have an audience. In short, your audience is your followers. Without further ado, let’s get into my list of tips to increase your Twitter audience. The best way to get the most clicks, followers and retweets is to tweet helpful and relevant content. You want to make sure the content that you are tweeting is enticing enough that people want to click on it and retweet it. Studies have shown that the more people you follow, the more followers you will have. This is also common sense. The more people that you follow, the more people that will follow you back. A great way to increase your Twitter followers is to use Twiends. This platform increases your exposure on Twitter as well as gives you tricks and tips on growing your following outside of Twiends. To rank in Twitter search don’t forget to use relevant keywords in your bio. Also, be sure to include your city or region to appeal to local users. Tweets with hashtags are said to get 2x more engagement than those without. Hashtags also attract new followers looking for those keywords. Users who are considering following you will most likely look at your bio. You want to make it professional and interesting. Be sure that it accurately represents you and your business. Use a personal picture in your profile picture instead of your logo. People are more likely to follow your face than to follow a profile without. Posting on a regular basis will increase your visibility. 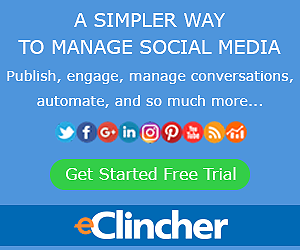 To ensure that you can do so use tools like Social Jukebox and eClincher to schedule your tweets. You can check out my Social Jukebox review by clicking here. Make it easy for your website visitors to share your content when on your website. Be sure that you have a follow button on each post. This is very important. Tweeting motivational and inspirational quotes are helpful to others. You never know, that quote may just make someone’s day. Not only are these types of tweets beneficial to others, they are also great for retweets. Tweeting on the weekends is said to increase engagement by 17% as well as CTR (click through rates). Be sure to tweet your best posts. Don’t forget to post helpful information as well. Chats are an excellent way to connect with prospects and consumers on a more personal level. Be sure to follow those that you chatted with. Most likely they will follow you back. Only when it is applicable @mention influential users, you may catch their attention this way. They may even retweet your content or follow you. Another way to catch their eye is to share quality content by those influencers. Make sure you do your research, you want to appeal to these users. You want to give people a reason to want to follow you, so you must make sure your social presence is on point. No one wants to add a user that offers no value, so make sure you are a valuable follower! Twitter is a great place to help others, share and exchange ideas and content, and connecting with others. You don’t want to get a reputation of someone who is just seeking a payday. Be helpful and your follower count will grow exponentially. Use the Twitter search to find other users that have the same interests and you do. Follow these users and most likely you will be followed in return as this is what Twitter is all about; connecting with others that share your interests. Follow Friday #FF or #FollowFriday is a Twitter tradition where people tweet about other Twitter users they think others would be interested in following. The hashtags used are #FF or #FollowFriday and this tradition happens on Fridays of course. According to Moz, the life of a tweet is 18 minutes. The likelihood that all your followers are online during the 18 minutes following your tweet is small. You want to make sure that you tweet the same content or links multiple times over the course of a couple of days to increase that tweets visibility. Be sure to link your other social profiles to your Twitter profile such as Google+, Facebook, LinkedIn, etc. Again, this increases your visibility. Be sure to answer any questions that are asked. In addition to this being good manners, it shows that you care about what your followers have to say. If your answer can benefit other’s, make your reply public so that others can benefit from it. Twitter traffic is at its peak between the hours of 1pm to 3pm so it is best to post your tweets between these hours. Be sure to tweet often. This will increase your visibility and with it your engagement. News that is related to your niche is one of the most retweeted types of content. Be sure to share relevant news with your followers. To find out what activities drive new followers to your account use FollowerWonk. This can be used to connect with new followers as well. Using the Tweet This plugin makes it easier to share content from your website to be tweeted by embedding content boxes on your site. This plugin will help in expanding your reach. Be generous with retweets. People like to know that you care about the messages they are delivering. Also, that you are happy to show them love by retweeting their tweets. Ask questions with your retweets; this will boost your engagement. The more you engage with your retweets the more attention you will draw. The use of Twitter cards will increase your engagement and visibility. When your content is retweeted the rich media, you included will be shown with their tweet. You do this by adding simple code to your site. As with all social media, you need to be active and engage with your followers. Have fun with your followers; Twitter users are awesome as is the platform! Following these simple tips will boost your Twitter visibility, engagement, and followers. I hope this article has given you some new ideas on how to get more people to follow you on Twitter. If you have any questions, comments, or anything that you would like to add please feel free to ask. I can be emailed at shwana@strategicmarketingaffiliates.com or you can leave your feedback below. Happy tweeting! I am in the online affiliate marketing business and I really need some good traffic to my website. I’m also quite new to Social Media platforms and Twitter and this article is very beneficial to me. I didn’t even know about this website called Twiends. ( I will have to find out more about it). I will definitely bookmark this article to refer back to it in the near future. Hello Nicolaas! Traffic is vital to the success for all our websites. It is a constant concern. I am glad that you enjoyed my article and it helped you out. Using Twiends has helped me out as well with my Twitter following. Thank you for taking the time to leave a comment and if you have any other questions in the future please don’t hesitate to ask. Thank you very much for the really helpful tips you have offered here for Twitter. I have been trying to follow people but that hasn’t been really successful for me. Hello Dave. I am glad that you enjoyed the article. You say that growing your following on Twitter has been difficult? I found that with Twitter you need to post a lot of content and stay relevant, make sure that you like other’s posts, etc. Twiends is a great option to grow your following definitely try it. Thank you for visiting and leaving a comment. Wishing you luck on growing your Twitter list. If you have any further questions please feel free to ask. So many great tips for earning followers on twitter. Do you have a personal favorite tool or tip? Hey Cacey! I am glad that you like the tips that I provided. I have to say that my personal favorite tool would be Twiends for gaining more quality followers. Also, with Twitter, you have to be consistent are people will unfollow you. If you are not interacting with them and their posts that doesn’t make you a good follower. What about you Cacey? Which tip did you like the best? Thanks for taking the time to leave a comment. Best wishes in all that you do.